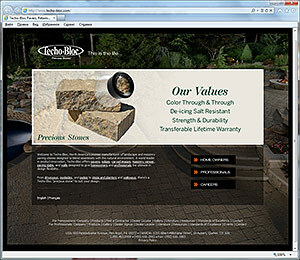 Welcome to Techo-Bloc, North America's premier manufacturer of landscape and masonry paving stones designed to blend seamlessly with the natural environment. A world leader in product innovation, Techo-Bloc offers pavers, edges, carved images, masonry veneer, paving slabs, and walls designed to give homeowners and professionals the ultimate in design flexibility. From driveways, poolsides, and patios to steps and planters and walkways, there's a Techo-Bloc "precious stone" to suit your design. An overlooked but a key component of landscaping is the retaining wall. Retaining walls are meant to control erosion, thus ensuring that dirt, debris, and sand remain in place. While they look simple enough to design and build, there is a process to constructing rigid and reliable walls. The installation task is better handled by professional builders. Getting expert retaining wall builders is smart and cost-effective. At Key Landscape and Irrigation, we will ensure that the installation job is done right the first time. We also understand that property owners have different ideas when it comes to designing their garden or backyard, so we always consider their inputs. Our experienced builders have tremendous experience and knowledge of various kinds of retaining wall structures, from installing gravity retaining walls to using segmental retaining wall blocks. Why Hire Certified Wall Installers? Hiring certified installers for your retaining walls is always an advantage. They do not only know which type of retaining wall will best suit your landscape, but they are also familiar with the local regulations. Key Landscape and Irrigation is an accredited Techo-Bloc installer, so you are guaranteed that each block is installed according to the manufacturer’s specifications. We are also fully informed of zoning laws and codes in New Hampshire since retaining walls of a certain height do require permits. Our team is also trained to handle specialized tools and equipment for retaining wall construction. Retaining walls can be built using a variety of materials - from high-density concrete blocks to stones and wooden planks. Using Techo-Bloc innovation, Key Landscape and Irrigation creates a hardy and unyielding retaining wall even if it has to hold a significant amount of soil. Among the key factors that we consider in building a retaining wall are the proposed wall height, slope angle, soil density to retain, back fill, and whether there are any heavy-weighted objects located on the slope (such as vehicles, structures, amenities, etc.). We ensure that a proper drainage solution is in place so that the wall will not be susceptible to tipping, sliding, or collapse. When poorly designed, these walls can pose hazard risks and may result in costly repair and maintenance jobs. The most common uses for these walls are pathways and garden areas, but they can also be installed to create a focal point in your outdoor space. You can border an in-ground pool, frame a garden or enclose an outdoor patio with a retaining wall. Whether your property is residential or commercial, the use of retaining walls will allow landscape features to co-exist. For tough and stunning retaining wall designs, please call us at (603) 352-6496!